Peggy DeMers - Alphorngruppe "Alpentraum"
Dr. Peggy DeMers, Associate Professor of Horn, joined the Sam Houston State University, Huntsville, TX faculty in 1991. Her musical and horn studies were at the Cincinnati Conservatory (M.M.) and the University of Wisconsin at Madison (B.M., D.M.A), with Douglas Hill and Michael Hatfield. Her extensive teaching, orchestral, and other ensemble experience includes principal horn with the Minnesota Opera Orchestra and with orchestras in Wisconsin, Minnesota and New York. Currently she is principal horn of the Lake Charles, Louisiana Symphony. From 1993-98 she was a member of the Spoleto Festival USA and the Festival of Two Worlds in Spoleto, Italy and appeared as guest artist (principal horn soloist) at the Mezzogiorno Concert series sponsored by the Gian Carlo Menotti in conjunction with the Festival of Two Worlds. Since 2004, Peggy DeMers has served as faculty/guest artist at the Assisi Performing Arts festival performing primarily chamber music in Assisi, Italy. Dr. DeMers' research and performances on the Alphorn have been recognized as truly authentic. She has given lectures for the International Horn Symposium in the USA and for regional workshops. She was featured on the cover of the AAA Home and Away magazine (summer 1991) performing on the Alphorn, and in the Minnesota American Traveler (1992). In 1999 she recorded "To the Winter Sun" by Douglas Hill on Thoughtful Wanderings, a MSR Classics label. In 2006, Dr. DeMers was the guest artist performing on the Alphorn for the Sigma Alpha Iota tri-annual national conference in Orlando, Florida. In 2007, the Swiss embassy requested her to perform the Alphorn for the opening of the IMAX Eiger mountain documentary film. In 2010, Dr. DeMers worked with Capitol One on a TV commercial, performing the Alpine horn. 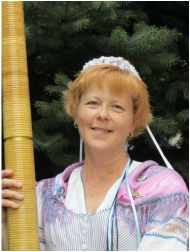 In 2009, Dr. DeMers began teaching Alphorn at the Midwest Alphorn retreat, a summer 5-day intensive Alphorn immersion program. It has been so popular and successful that it has included performances throughout the region.